The Honor Society of Nursing, Sigma Theta Tau International is dedicated to promoting excellence in nursing education, practice and research. Members include practicing nurses, instructors, researchers, policymakers, entrepreneurs and others. 446 chapters located at 543 institutions of higher education throughout Australia, Botswana, Brazil, Canada, Ghana, Hong Kong, Japan, Kenya, Malawi, Mexico, the Netherlands, Pakistan, South Africa, South Korea, Swaziland, Sweden, Taiwan, Tanzania, and the United States. Mary Kovaleski, MSN,RN - "The Impact of a Music Intervention on the Incidence, Severity and Duration of Delirium in in Older Acute Care Patients"
Nathalie Confiac - "Mexican American Cultural Beliefs of Healthy and Unhealthy Weight in Children 2 to 11 years of Age"
Angele Karakachian MSN, RN - "Nurse's Moral Distress and Burnout when Caring for Victims of Child Abuse"
Dr. Joan Lockhart, Dr. Rebecca Kronk and Dr. Mary Ellen Glasgow attended different academy programs that ended at the Biennium. Drs. 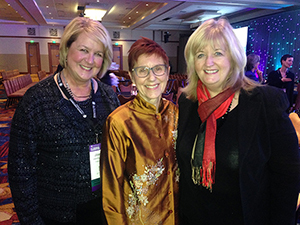 Glasgow and Lockhart were mentors for other nurses, while Dr. Kronk was a mentee in her academy. 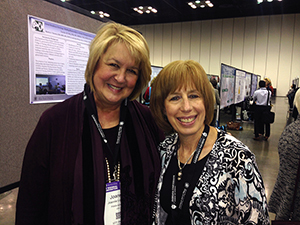 Dr. Cheryl Levitt is a PhD alumna who was among the first in our online program. Dr. Levitt lives in Israel, and teaches online full-time at SUNY Delhi in upstate NY. The stated purpose of the Duquesne Chapter is to recognize superior achievement in nursing and to develop qualities of leadership among nursing professionals and students, to foster high professional standards of nursing practice, and to strengthen commitment to the ideals and purposes of professional nursing. Chapter has inducted 1,036 members and currently has 313 active members. Epsilon Phi is a chapter that values research and best practice. Each March, a $2,000 research scholarship for members of Epsilon Phi is awarded. The Sigma Induction ceremony in the spring inducts eligible undergraduate, second degree students, MSN, PhD and DNP students. Free Continuing Educational Units, which are needed to maintain an RN licensure in Pennsylvania and many other states. The Junior Nurse Leader position provides an opportunity for a senior nursing student to develop leadership skills through mentorship and experience in the Epsilon Phi Chapter of STTI. Leadership activities include: being a STTI representative in the School of Nursing, assisting with Chapter administrative activities, and participating in local, regional, and national STTI events.